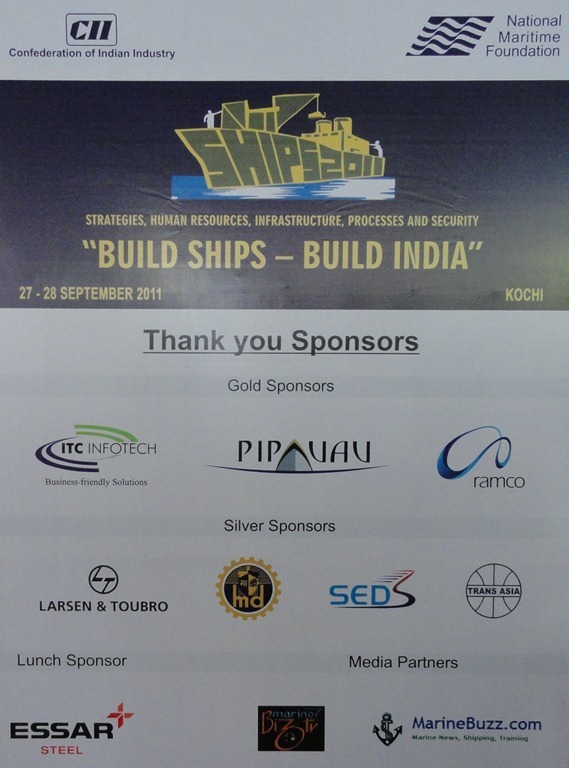 Confederation of Indian Industry (CII) and National Maritime Foundation (NMF) hosted SHIPS 2011 (Strategies, Human Resources, Infrastructure, Processes and Security) Conference with the theme ‘Build Ships – Build India’ at The Gateway Hotel, Kochi, Kerala on 27 and 28 September 2011. 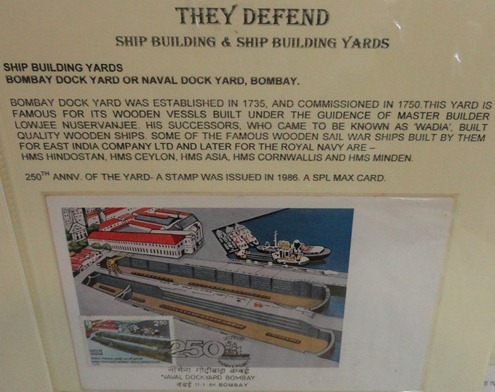 It is worth noting that Kochi in addition to being a major port, is having a large Public Sector Shipyard and is also the Head Quarters for the Southern Naval Command of the Indian Navy. The Cochin University of Science and Technology (CUSAT) offers courses in marine engineering and marine sciences. Further Naval Academy of the Indian Navy (at Ezhimala), Coast Guard Academy (coming up at Azhikkal), National Institute for Research and Development in Defence Shipbuilding (NIRDESH coming up at Chaliyam, Kadalundi Beypore) are in Kerala. The two day seminar was attended by the representatives from Ship Owners, Ship Builders, Marine Equipment Manufacturers/Suppliers, Classification Society, Indian Navy, Indian Coast Guard and other marine disciplines including foreign delegates. On the evening of 27 September 2011, Prof P J Cherian of Kerala Council for Historical Research was honoured by Vice Admiral KN Sushil, Flag Officer Commanding-in-Chief, Southern Naval Command and NMF for his report on Pattanam Archaeological Research 2011. I have covered this Seminar SHIPS 2011 in three parts (this being part 1 of 3). Opening Address: by Mr KKM Kutty, Past Chairman, CII SR and CEO & Managing Director Sealings & Jointings. Theme Address: by Vice Admiral (Retd) Pradeep Kaushiva, Director, National Maritime Foundation. Keynote Address: by Mr Paul Antony, IAS, Chairman, Cochin Port Trust. Special Address: by Mr Manoj Joshi, IAS, Secretary – Ports & Secretary PWD (Addl Charge), Government of Kerala. Address by Chief Guest: Vice Admiral B Kannan, Programme Director, ATV Project, Indian Navy. Concluding Remarks: by Gp Captain (Retd) LV Mohandas, Head – IT & Internal Security, CII – SR.
Maritime Agenda 2010 – 2010 was released by the government on 13 January 2011; as a follow up, IMTC 2011 was held at Chennai on 21 and 22 January 2011; IMTC 2011 has triggered this SHIPS 2011 to take place now. Maritime Agenda 2010 – 2010 released by the government gives a predictive analysis for ports and trades upto the year 2025; it needs further refinement as it does not give trend analysis pertaining to shipping, shipbuilding, human resources. Shipping industry is a unique industry where ships can be built anywhere in the world, flagged anywhere in the world, brought duty free and can be operated anywhere in the world as convenient; this industry grows only where the construction cost and time are less and also where the government policies, rules are industry friendly. Withdrawal of subsidies has upset the Indian shipping industry; Indian Shipbuilding industry needs ten more years to become a self sustaining industry. Now the shipbuilding industry needs to be declared as a strategic industry (with simple tax policy) and has to be governed by a fully empowered single regulating body. Inland Waterways needs to be strengthened for cargo movement and for ferrying passengers to accelerate economic growth of the country and this can give a boost for building inland water crafts by the shipbuilding industry. Despite increase in the volume of global trade through sea, Indian merchant fleet remains small due to lack of growth in Indian shipping industry; this has forced us to procure our strategic requirement of crude, oil and coal through foreign flagged vessels (this is not desirable during conflicts). To increase the Indian merchant fleet strength, private shipyards must focus on building large merchant vessels. Labour intensive component of shipbuilding has driven this industry from Europe to China, South Korea and Japan. Indian Maritime University has to focus on addressing the present shortage of skilled man power needed to design, build and to man ships to meet the growing demand of the shipping industry. Functioning of private institutes offering courses in shipping are to be streamlined. Maritime Agenda 2010 – 2010 released by the government focuses more on 13 major ports as they are under the control of the central government and the 187 non major ports (earlier known as minor ports) are left out as they are under the control of the state governments; however Gujarat has taken the initiative to develop maximum number of non major ports. Non availability of land, hinders expansion of Public Sector shipyards. Indian Defence Public Sector Units (DPSU) are unable to meet the shipbuilding requirements of Indian Navy and Indian Coast Guard; private shipyards are supporting DPSUs by undertaking off loaded jobs from these DPSUs; now the recently proposed Joint Venture (JV) between MDL and Pipavav shipyards is a welcome move. Ports must be automated for faster handling of containers and use port specific software for faster turn around of ships; operating cost of ships needs to be minimised by improving berthing, dredging, cargo handling facilities in ports. NMF has undertaken the task of benchmarking the productivity of Indian shipyards. 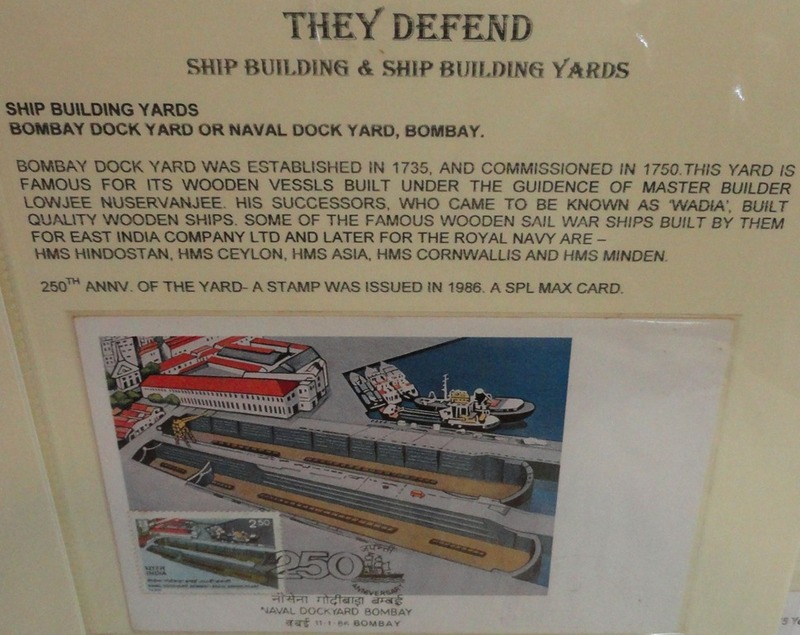 Philatelic Exhibition by Mr D Hemchandra Rao, Naval Historian & Chairman, Naval Philatelic Society. Release of Special Cover to mark the occasion: SHIPS 2011 “Build Ships – Build India”. More photographs are available in Flickr.